Working hours: from 10 a.m. to 5 p.m. Excursion tours start at 11 a.m., 12 p.m., 2 p.m., 3 p.m., 4 p.m., 5 p.m. On matchdays mini-tours are organized. 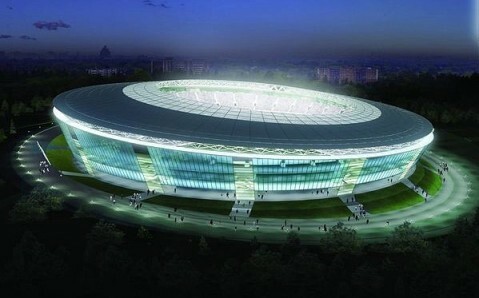 In 2009, Donetsk acquired one of its brightest attractions - ultramodern five-star stadium 'Donbas Arena', which is situated in the picturesque park at the city's center. Not just football fans, but mere tourists, who heard a lot about its beauty and originality, rush to see this peculiar building in Donetsk. Today 'Donbas Arena' for 50 000 seats is one of the best stadiums in Europe and the first one in Ukraine that was built for the European Championships 2012 in accordance with UEFA standards. 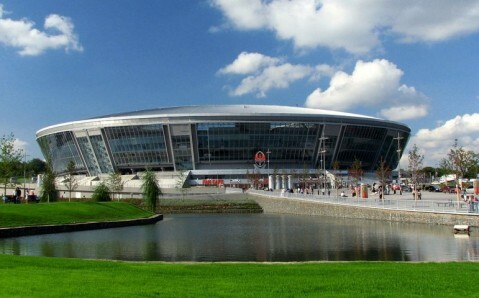 The main distinction of Donetsk's Arena is its unusual oval form and fully glass facade. Thanks to intricate design, offered by 'ArupSport' company that had already designed English stadium 'Manchester City', German 'Alliance' and Spanish 'Valencia', 'Donbas Arena' is reminiscent of huge flying saucer that landed in the city park's center. And in the night time, being illuminated by colorful lights from all sides, the stadium is reminiscent of large sparkling diamond. 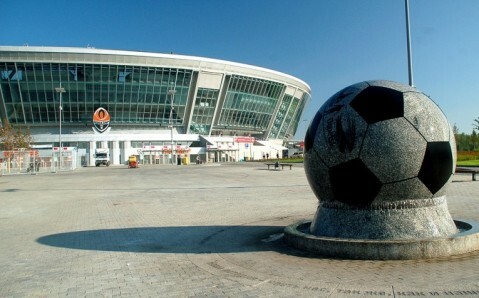 Due to this fact, local residents often call the 'Arena' Donetsk's true treasure. However, the stadium impresses not only from outside, but from inside as well. Thanks to special daily tours, you may see its impressive features, feel its exceptional atmosphere and visit inaccessible for mere viewer places. Guides tell you many interesting facts from arena's building history, show training facilities, media-zone, conference-hall, let you sit on coaches' seats and substitutes' bench. 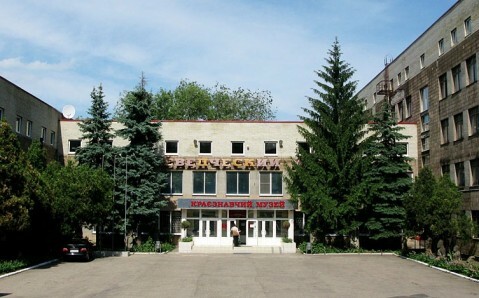 The excursion also includes visiting Ukraine's largest sports museum - the Museum of Ukrainian Football Club 'Shakhtar', to which 'Donbas Arena' is a home stadium. 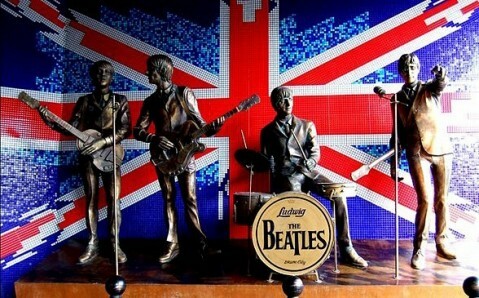 Museum has multimedia exposition and souvenir shop with club's symbolic. There are three restaurants, lounge-bar, several dozens of fast-food restaurants and a fitness center on the stadium's premises. 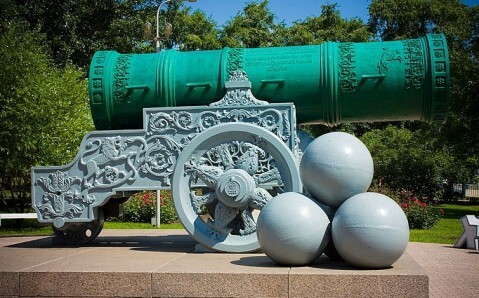 One more 'Donbas Arena's and Donetsk's unique sight is 28-ton ball-fountain installed in front of the stadium and recognized as the largest turning granite sphere in the world. The ball created by German experts is almost three meters in diameter. Fabulous park with stone garden, series of fountains and handmade water bodies is a sort of frame for Donetsk's 'diamond'. 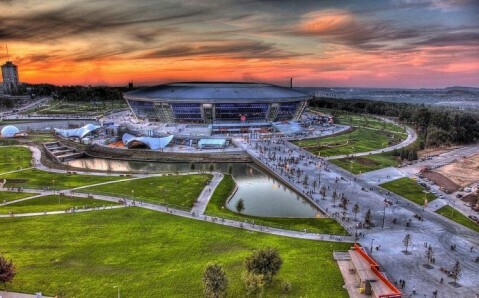 'Donbas Arena's park zone is city's largest recreational center, which is daily open for Donetsk's residents and guests. Гордость Донецка и любимица президента ФК Шахтёр. Надеюсь что она переживёт события кровавого 2014 и продолжит радовать горожан и гостей города. Лучший стадион в Восточной Европе! Вид на парк у стадиона "Донбасс Арена"
Лучший стадион Украины, этим всё сказано! 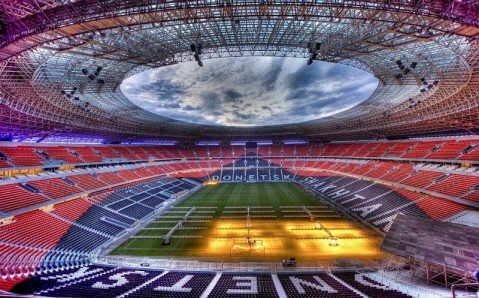 Ukraynaya yolunuz düşerse , Donbass Arena yi ziyaret etmeden gitmeyin. Stad ve hemen yanindaki kültürel park gözlere şenlik. Отношение к гостевому сектору отвратительное, организация ужасна, держали в клетке как животных, хотя стадион уже был пуст давно. Лучший украинский стадион без базара. Отличный стадион!очень понравился парк вокруг!!! Самый лучший стадион в восточной Европе! Без преувеличения и лести. Впечатлений миллион...спасибо тебе Украина,спасибо тебе Донбасс!!! Донбасс Арена совершенно заслужено называют жемчужиной Донецка. Помимо проведения матчей наивысшего уровня, стадион оборудован прекрасными ресторанами, фаст фудами, ночным клубом и парком отдыха. «Донбасс Арена» признана лучшим стадионом чемпионата Европы. One of the best stadiums in the World! A night of remarkable European football for Fulham in the Ukraine, with the Whites defeating Shakhtar Donetsk, 3-2 on aggregate. A 1-1 draw at the Donbass Arena saw the Whites through to the final 16. Орг-ия входа на стадион на полуфинал евро2012 совсем не понравилась на фоне просто идеальной организации в Киеве. толклись в очереди около получаса. В Киеве на 20тыс чел больше и ни секунды простоя! This stadium is huge and magnificent! It took 1,158 days to construct this behemoth. That’s more than 3 years. With a panorama of blue lights emanating from the stadium, fans from miles away know where to fulfill their fútbol cravings. Vous êtes ressortissant français et vous assistez aux matches de l'EURO 2012 ? Consultez nos Conseils aux voyageurs sur les précautions à prendre pour passer un bon séjour ! 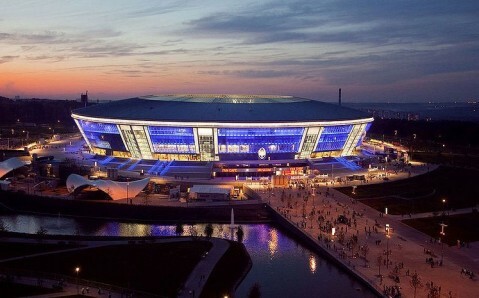 With a capacity of 51,504 seats, "Dombass Arena" through three matches in Group C, which France and England-Ukraine-France, as well as a quarterfinal and a semifinal. Будет тепло зимой. поставили обогрев. «Донбасс Арена» — первая в Украине и Восточной Европе спроектирована и построена в соответствии со стандартами УЕФА для стадионов категории «Элит». Take the tour! It shows all the rooms on the arena!